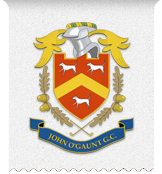 The Friendly Ladies Team traveled to John O'Gaunt on Wednesday 22nd June to play the 4th match of the season. Despite the rain the team carried on regardless. John O'Gaunt is a very difficult course and the Chesfield Ladies coped very well with conditions. There were some very close matches, with Jackie and Margaret fighting it out to the bitter end and finishing all square! Lauren and myself won our match! But John O'Gaunt were on home ground and the final score was 3½ - 1½ in favour of John O'Gaunt. Well done everybody! Next match is Mowsbery at home!